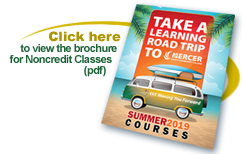 The Center for Continuing Studies (CCS) at Mercer County Community College offers a constantly evolving wealth of classes and programs that update skills, provide certifications, and satisfy an impressive variety of interests -- all enabling lifelong learning and growth both professionally and personally. We are glad you are here! Our goal is to offer lifelong learning opportunities that meet emerging business and professional development needs as well as personal interests of those in the community we serve. We strive to stay current on the trends in the job force so that we may best prepare our students to excel in their career or embark on a new one. We offer a wealth of classes and programs that update skills, provide new and improved certifications and enable growth both professionally and personally. For employers who are able to assist their employees in gaining expertise for immediate use on the job, we offer employer sponsorship opportunities. The form can be downloaded HERE. We appreciate your visiting our site and hope you find what you are looking for. If there is an area that you would like to see added, please contact us. As your community college, we look to serve community needs in the best ways possible. The Center for Continuing Studies also offers Career Coach - a free resource for individuals interested in learning about their career options. TO REGISTER: Call (609) 570-3311 or REGISTER ONLINE. To register in person or via fax or e-mail, please download the Registration Form. Join our mailing list by e-mailing ComEd@mccc.edu. DON'T LET YOUR COURSE RUN THE RISK OF CANCELLATION! Courses are scheduled to run well in advance. Our energetic, knowledgeable and engaging instructors look forward to presenting you with the tools you need to reach your personal and professional goals. To do that, they need time to prepare their materials. If you wait until the last minute to register, it will be too late. A decision is made several weeks in advance on whether there are enough registrants to run a course. Consider ONLINE LEARNING with CCS and Ed2Go! Take part in both instructor-led courses and career training programs. 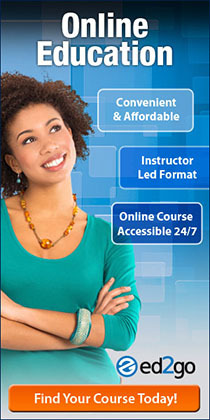 Are you enrolling for a course that can assist you on the job? Did your employer recommend additional training? If so, register for your course by filling out the registration and employer sponsorship forms below. When they are filled out, just fax them to 609-570-3883 to register. Swim, Community Association Manager, UCC, Culinary (including ServSafe), NICET, Pavement, Construction Math, Pervious Concrete, ASHI, Defensive Driving, Heartsaver CPR, Red Cross Babysitting, BLS for Health Care Providers, Floral Design, Ed2Go, Wine and Beer. Due to record vetting, courses that have Pre-requisites are NOT available for online registration. Please use the other methods (mail, fax, in person) when registering for these classes. Looking to develop job skills? Thinking about a career path? Interested in personal development with a new talent or hobby? Sign up to receive our newsletter and information on courses.